The Robotex IMP.A.C. 125 A-PR TOP is a completely automatic machine, complete of the movement roller conveyors of the empty and full pallets. 1. possibility to palletise each kind of bags with different sizes and weights, from 5 to 50 Kg, from 5 to 50 Kg, utilising the same equipment. 3. possibility of installing this palletiser in restricted spaces because the overall dimensions are reduced (4000×2400 mm). It’s a machine ideal to be inserted at the end of the line of the completely automatic productive systems where the operator presence is not provided for the productions max 400 b/h. The key part of the machine is the pliers that take the bags. This plier totally encloses the bag, enabling the operation with each kind of bag ( paper, jute, plastic, valve, sewn bags, electro welded bags) even with the most difficult bags, like half-empty ones, bags filled with very low viscosity products (water). The pliers is completed with integrated bag pressing device The bag, coming from an upstream line, is pressed to become even and compact, then it goes to a positioning station to be drawed by the pliers that picks up the bag. The bag is picked up, oriented and pressed on the pallet following the preset program. The cycle will repeat itself until the finishing of the pallet that will be emptied and replaced, to begin a new cycle. The movement system is with Cartesian axes and the positioning check has made by encoders. All the movements synchronisms are coordinated by a programmable modular system (PLC). 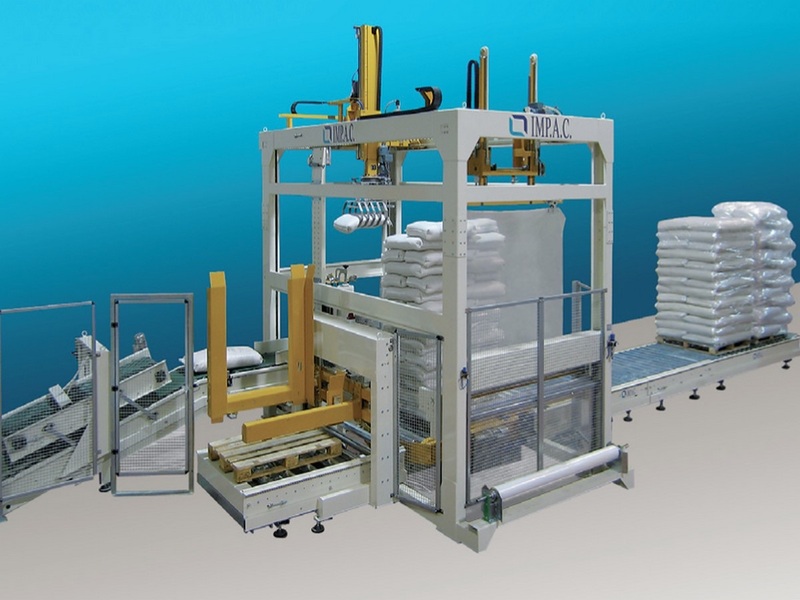 The machine can be programmed to palletise bags of different dimensions, formations and layers number.